The airway epithelium is the first line of host defense against pathogens. The short palate, lung, and nasal epithelium clone (SPLUNC)1 protein is secreted in respiratory tracts and is a member of the bacterial/permeability increasing (BPI) fold–containing protein family, which shares structural similarities with BPI-like proteins. On the basis of its homology with BPIs and restricted expression of SPLUNC1 in serous cells of submucosal glands and surface epithelial cells of the upper respiratory tract, SPLUNC1 is thought to possess antimicrobial activity in host defense. SPLUNC1 is also reported to have surfactant properties, which may contribute to anti-biofilm defenses. The objective of this study was to determine the in vivo functions of SPLUNC1 following Pseudomonas aeruginosa infection and to elucidate the underlying mechanism by using a knockout (KO) mouse model with a genetic ablation of Splunc1. Splunc1 KO mice showed accelerated mortality and increased susceptibility to P. aeruginosa infection with significantly decreased survival rates, increased bacterial burdens, exaggerated tissue injuries, and elevated proinflammatory cytokine levels as compared with those of their wild-type littermates. Increased neutrophil infiltration in Splunc1 KO mice was accompanied by elevated chemokine levels, including Cxcl1, Cxcl2, and Ccl20. Furthermore, the expression of several epithelial secretory proteins and antimicrobial molecules was considerably suppressed in the lungs of Splunc1 KO mice. The deficiency of Splunc1 in mouse airway epithelium also results in increased biofilm formation of P. aeruginosa. Taken together, our results support that the ablation of Splunc1 in mouse airways affects the mucociliary clearance, resulting in decreased innate immune response during Pseudomonas-induced respiratory infection. The airway epithelium is a critical part of the innate immune system. The protective arsenal of the airway epithelium consists of physical barriers and a vast array of mediators, such as cytokines, secretory proteins, and antimicrobial peptides and proteins (1). Airway epithelial cell–specific antimicrobial activity usually provides immediate protection against pathogens. This antimicrobial function of epithelium ensures and initiates an appropriate host defense against invading pathogens (2). In addition to antimicrobial molecules, airway secretion and the mucus-containing surface lining fluid also contribute to the host defense during airway infection. Inhaled pathogens trapped in the mucus layer of airway surface fluid are first removed by the mucociliary clearance mechanism of the underlying airway epithelium, and then by neutrophils and monocytes/macrophages recruited into the airway in response to inflammatory mediators released by epithelial cells and inflammatory cells (3). Palate, lung, nasal epithelium clone (PLUNC), described as having a similar structure to that of the bacterial/permeability increasing (BPI) family protein, has been demonstrated to possess antimicrobial activity (4). Initially termed PLUNC, the gene product was later renamed short PLUNC1 (SPLUNC1) and is also referred to as SPURT (secretory protein in upper respiratory tracts) or BPIFA1 (BPI fold containing family A, member 1). SPLUNC1 is a secretory protein with a molecular mass of ∼25 kDa that is secreted by surface epithelium and submucosal glands (5, 6). On the basis of its homology with BPI and restricted expression of SPLUNC1 in the serous cells of the upper respiratory tract, SPLUNC1 is thought to have antimicrobial activity, a theory now supported by several studies (4, 7–9). Mice overexpressing SPLUNC1 exhibit enhanced protection against Pseudomonas aeruginosa, Mycoplasma pneumonia, and carbon nanotubes (7, 10, 11). Additionally, it has been suggested that SPLUNC1 may be required for the regulation of certain physical properties of airway surface liquid, including airway surface liquid volume (12) and surface tension (12). P. aeruginosa is a type of Gram-negative, motile, non–spore-forming, rod-shaped bacteria that causes a variety of infectious diseases in animals and humans. It is increasingly recognized as an emerging opportunistic pathogen of clinical significance, often causing nosocomial infections. P. aeruginosa infection is a life-threatening disease in immunocompromised individuals, and its colonization has been an enormous problem in cystic fibrosis patients. Several epidemiological studies indicate that antibiotic resistance is increasing in clinical isolations of P. aeruginosa (13) because it can develop new resistance after exposure to antimicrobial agents. Thus, a better understanding of the antimicrobial mechanisms of the naturally secreted SPLUNC1 and how it protects its host from bacterial infection may provide alternative therapeutic approaches to combat respiratory P. aeruginosa infection. In this study, we extend our studies of SPLUNC1 antimicrobial functions by using loss of function approaches to investigate the in vivo consequences of the loss of SPLUNC1 in genetically ablated Splunc1 knockout (KO) mice. Our results show that Splunc1 KO mice display accelerated mortality and increased susceptibility to P. aeruginosa infection. Furthermore, we explore the relationship between SPLUNC1 expression and airway secretion integrity. Deficiency of Splunc1 results in significantly decreased expression of several secretory and antimicrobial proteins that are important to host antimicrobial defense. Taken together, our results indicate that SPLUNC1 is critical for protection against the airway pathogen P. aeruginosa, a biological activity that may require intact expression of SPLUNC1 to maintain sufficient antimicrobial activities and effective mucociliary clearance upon respiratory bacterial infection. Splunc1-null mice were generated through screening of a N-ethyl-N-nitrosourea mutagenized sperm archive as previously described (14). The homozygous Splunc1+/+ mice and Splunc1−/− mice were bred to maintain their homozygosity and to generate a mouse cohort of both wild-type (WT) and Splunc1 KO mice with the same genetic background for the experiments. Mice were maintained in a specific pathogen-free status in a 12 h light/dark cycle. All procedures were conducted using mice 6–9 wk of age maintained in ventilated microisolator cages housed in an American Association for Accreditation of Laboratory Animal Care–accredited animal facility. Protocols and studies involving animals were conducted in accordance with National Institutes of Health guidelines and approved by the Institutional Animal Care and Use Committee at the University of Pittsburgh. Total mRNA was isolated from the upper two lobes of right lung tissues of WT and Splunc1 KO mice using TRIzol reagent (Life Technologies, Carlsbad, CA). Quantitative PCR was performed using an ABI 7900HT real-time PCR system (Applied Biosystems, Foster City, CA) and primers of Muc5ac, Muc5b, Clara cell secretory protein (CCSP), Foxj1, Cxcl1, Cxcl2, Cxcl5, Ccl20, LL37, lactoferrin, lysozyme, and β-defensin 2. Validation tests were performed to confirm equivalent PCR efficiencies for the target genes. Test and calibrator lung RNAs were reverse transcribed using a high-capacity cDNA reverse transcription kit (Life Technologies), and PCR was amplified as follows: 50°C for 2 min, 95°C for 10 min, 40 cycles; 95°C for 15 s; 60°C for 1 min. Three replicates were used to calculate the average cycle threshold for the transcript of interest and for a transcript for normalization (β-glucuronidase; Assays on Demand; Applied Biosystems). Relative mRNA abundance was calculated using the ΔΔCt method. The P. aeruginosa strain (PAO1, ATCC BAA-47) was used for all experiments. PAO1 obtained from a single colony was stored in aliquots at −80°C in 15% glycerol/tryptic soy broth (TSB). For each experiment, an aliquot of bacteria was grown for 16 h at 37°C in autoclaved TSB with shaking. An aliquot of the overnight grown bacteria was then diluted 1 ml into 5 ml fresh TSB and incubated for an additional 2 h at 37°C with shaking. Bacteria were washed twice and resuspended in 10 ml PBS. Mice were anesthetized with inhalation of isoflurane and treated with PAO1 through intranasal instillation of ∼1.5 × 107 CFU per mouse in 30 μl PBS. Control mice were intranasally inoculated with 30 μl PBS. For the survival test, mice were anesthetized with 2.5% avertin and then infected with an in intranasal instillation of PAO1 at a dosage of 109 CFU/mouse. The number of CFU was determined by serial dilution and quantitative culture on TSB agar plates. The left lung lobe was homogenized in 1 ml saline and placed on ice. Dilution of 100 μl lung tissue homogenate or bronchoalveolar lavage fluid (BALF) was mixed with 900 μl saline. Four serial 10-fold dilutions in saline were prepared and plated on TSB agar plates and incubated for 18 h at 37°C, with each dilution plated in triplicate. The colonies were then counted and surviving bacteria were expressed in log10 units. At 6 or 24 h after treatment of PAO1, mice (six mice per group) were anesthetized with 2.5% tribromoethanol (Avertin). The trachea was cannulated, the lungs were lavaged twice using 1 ml saline, and the BALF samples were pooled. A 16-μl aliquot was stained with 4 μl acridine orange (MP Biomedicals, Santa Ana, CA), and cells were counted with a Vision Cell Analyzer cell counter (Nexcelom, Lawrence, MA). An additional aliquot was placed onto glass microscope slides (Shandon Cytospin; Thermo Fisher, Pittsburgh, PA), stained with Diff-Quick; cell differential was determined microscopically. A total of 400 cells of every slide were counted at least twice for inflammatory cell differential counts. Cytokine levels in BAL were quantified using the mouse cytokine multiplex panel assay (Milliplex; Millipore, Billerica, MA). The expressions of IL-1β, IL-6, IL-10, IL-12p70, IL-17, IFN-γ, TNF-α, GM-CSF, KC, IFN-γ–inducible protein 10, VEGF, and MIP-1α were analyzed using the Luminex assay system, based on manufacturer’s instructions. Standard recombinant protein solution was used to generate a standard curve for each analyzed protein. Absolute cytokine concentrations were calculated from the standard curve for each cytokine. A slightly modified version of the microtiter plate assay developed by O’Toole and Kolter (15) was used. Briefly, overnight planktonic cultures of PAO1 were inoculated into 100 μl DMEM in a 96-well culture-treated polystyrene microtiter plate (Fisher Scientific, Pittsburgh, PA) with or without recombinant SPLUNC1 or antibiotic controls. Wells filled with growth medium alone were included as negative controls. After 3 h incubation at 37°C, surface-adherent biofilm formation was measured by staining bound cells for 15 min with a 0.5% (w/v) aqueous solution of crystal violet. After rinsing with distilled water, the bound dye was released from the stained cells using 95% ethanol, and OD was determined at 590 nm. Primary mouse tracheal epithelial cell cultures were established as previously described (14). Briefly, Splunc1−/− and Splunc1+/+ mice were euthanized and their tracheas immediately removed. Tracheal epithelial cells were dissociated and seeded onto collagen-coated, semipermeable membranes with a 0.4-μm pore size (Millicell-HA; surface area, 0.6 cm2; Millipore, Bedford, MA). Cells were maintained in small airway epithelial cell growth medium (Lonza, Allendale, NJ) and the mucosal medium was removed 24 h after seeding and the cells were allowed to grow and differentiate at the air–liquid interface. To assess the viability of bacteria, biofilms were grown on polarized and confluent mouse tracheal cells under static conditions as previously described (16). Briefly, PAO1 were inoculated on the apical surface of epithelial cells grown on filters (multiplicity of infection of 25). After 1 h of incubation at 37°C, unattached bacteria were removed. Filters containing epithelial cells and the attached bacteria were returned to 37°C and 5% CO2 for the duration of each experiment (5 h). Arginine was added to the medium to prolong the viability of tracheal epithelial cells incubated with bacteria under static conditions. At the end of the treatment, biofilms remaining at the apical side of airway cells were washed once with minimal Earle’s medium, and then 0.1% Triton X-100 was added to the medium for 15 min to lyse the epithelial cells and dissociate the biofilms. The lysate was vortexed for 3 min and serial dilutions were spot titered onto Luria–Bertani plates to determine the CFU per milliliter. Lung tissues were harvested at 6 and 24 h after infection and inflation fixed in situ with 4% paraformaldehyde at 10 cm H2O for 10 min with the chest cavity open. The right lobe was embedded in paraffin and 5-μm sections were prepared. Sections were stained with H&E, and histological evaluation was performed to examine bacterial infection-induced pathological severity. The stained lung sections were evaluated in a double-blinded fashion under a light microscope, using a histopathologic inflammatory scoring system as described previously (17). Data are expressed as means ± SEM. Statistical comparisons between the groups of mice were made using ANOVA, followed by a Dunnett multiple comparison test (one-way ANOVA) or the Bonferroni multiple comparison test (two-way ANOVA). A p value of <0.05 was considered statistically significant. Determinations of the significance of the differences in survival outcomes between Splunc1 KO mice and WT control littermates after PAO1 infection were calculated by Kaplan–Meier survival curve comparisons, as well as the p values derived from a log-rank test. To determine whether Splunc1 affects susceptibility to PAO1-induced lung infection, groups of 6- to 9-wk-old Splunc1 WT and KO mice were challenged through intranasal instillation. We carried out preliminary studies to determine the optimal dosage for survival experiments. There was no mortality within 48 h in WT mice when concentrations of PAO1 at 107 and 108 CFU/animal were administered. We determined the survival of mice against PAO1 infection at a dosage of 109 CFU/animal to reflect the severity of acute respiratory infection. When both Splunc1 WT and KO mice were challenged with 109 CFU/animal of PAO1, KO mice showed accelerated and increased mortality (log-rank test, p = 0.0056) (Fig. 1). Upon PAO1 bacterial infection, Splunc1 WT mice started showing mortality at 18 h postinfection, whereas other infected mice gradually died throughout the time period until all mice died at 52 h postinfection (mean survival time, 29.53 ± 11.79 h). The death of Splunc1 KO mice was observed as early as 10 h after bacterial infection, whereas all of the remaining Splunc1 KO mice succumbed to PAO1-induced lung infection within 44 h (mean survival time, 20.21 ± 8.00 h). These results indicate that Splunc1 is essential to prolonged survival following PAO1 infection. Splunc1 KO mice exhibit increased susceptibility to P. aeruginosa–induced acute pneumonia. Splunc1 KO and WT mice were intranasally inoculated with 109 CFU PAO1 per mouse. Survival is represented by Kaplan–Meier survival curves (p = 0.0056, 95% confidence interval, log-rank test). Results were obtained from two independent experiments (n = 19 mice/group). To delineate the underlying mechanisms for Splunc1-regulated susceptibility to PAO1 infection, the different host innate immune responses of Splunc1 WT and KO mice were first examined. To determine the bacterial burden in lungs of Splunc1 KO and WT mice, animals were intranasally challenged with 1.5 × 107 CFU/mouse PAO1 and sacrificed at 6 and 24 h after PAO1 infection. The ablation of Splunc1 expression resulted in increased sensitivity to bacterial infection. Splunc1 KO mice showed a 2.5-fold higher level of PAO1 in the left lung when compared with the WT control mice at 6 and 24 h postinfection (Fig. 2A). Six hours after PAO1 exposure, ∼10–15% of lung bacterial burden could be detected in the BAL; Splunc1 KO mice showed a nonsignificant tendency toward increased levels of bacteria when compared with those of WT mice (Fig. 2B). However, at 24 h postinfection, the bacterial burden in the BAL was significantly higher in Splunc1 KO mice than in WT mice. These data suggest that deficiency of Splunc1 results in increased susceptibility to bacterial infection. Splunc1 KO mice are susceptible to P. aeruginosa–induced respiratory infection. Age-matched Splunc1 KO and WT mice were intranasally inoculated with 1.5 × 107 CFU PAO1 per mouse. (A) CFU in lung homogenates from left lobes were determined at 6 and 24 h after PAO1 infection. (B) At 24 h postinfection, Splunc1 KO mice exhibited significantly increased bacterial load in their BALF. Results are mean ± SEM from three independent experiments; n = 4–6 mice/treatment group. **p < 0.01 for Splunc1 KO to WT comparisons at each time point. To determine whether the increased lung bacterial burden in Splunc1 KO mice results in increased inflammation, we analyzed the BAL cell profile and lung tissue inflammation in the lungs of Splunc1 KO and WT mice at 6 and 24 h following PAO1 infection (Fig. 3). BAL total cell count (2–4 × 105cells/lung) or differentials (≥98% macrophages) from unexposed Splunc1 KO mice were not different from those from WT control mice. After 6 h of bacterial exposure, the total inflammatory cell counts in BALF increased in both Splunc1 KO and WT mice, but the increase was greater in Splunc1 KO mice than the increase in WT mice. The difference in increased total inflammatory cell number between the Splunc1 WT (71.06 ± 16.25 × 105/ml) and KO (126.08 ± 18.72 × 105/ml) mice was statistically significant. The total macrophage number in the BAL at 6 h postinfection was higher for Splunc1 WT mice (28.33 ± 6.21 × 105) than it was for KO mice (16.63 ± 3.20 × 105), which may suggest more effective bacterial killing in WT mice. Conversely, the total polymorphonuclear leukocyte (PMN) number was significantly lower in Splunc1 WT control mice (51.45 ± 18.24 × 105) than in KO mice (109.22 ± 20.25 × 105) (Fig. 3B, 3C). The total BAL cell count decreased at 24 h after exposure in both Splunc1 WT and KO mice, but there were still more inflammatory cells in the KO mouse group. PAO1 infection resulted in increased interstitial inflammation in the lungs (Fig. 4). We observed the increased number of inflammatory cells after Pseudomonas infection in both airways and alveolar regions, but the increase was more prominent in the alveolar region. To determine whether PAO1 infection-induced lung inflammation was influenced by Splunc1, lung histopathology was assessed after infection. Lungs from uninfected WT control mice were not different from those from Splunc1 KO mice (data not shown). There was slightly more infiltration of PMNs in Splunc1 KO mice than in their WT littermates at both 6 and 24 h postinfection (Fig. 4). Moreover, lung tissues from Splunc1 KO mice (Fig. 4B, 4D) contained more areas of focal peribronchial and alveolar neutrophilic infiltrates than did lungs from WT control mice (Fig. 4A, 4C). Splunc1 KO mice show increased inflammatory cell recruitment following P. aeruginosa infection. (A) Total inflammatory cells were significantly higher in Splunc1 KO mice than in WT mice at both 6 and 24 h after PAO1 challenge. (B) Macrophages in BAL from WT mice increased more than those in Splunc1 KO mice after 6 h bacterial exposure. (C) Total neutrophils in BAL from Splunc1 KO mice increased more than those from WT mice. Results are means ± SEM from three independent experiments; n = 4–6 mice/group. *p < 0.05, **p < 0.01 for Splunc1 KO to WT comparisons at each time point. Splunc1 KO mice display more severe lung injury after P. aeruginosa infection. Lung tissues were harvested with PAO1 challenge at 6 (A, B) and 24 h (C, D) postinfection, fixed, and H&E stained for histological evaluation. 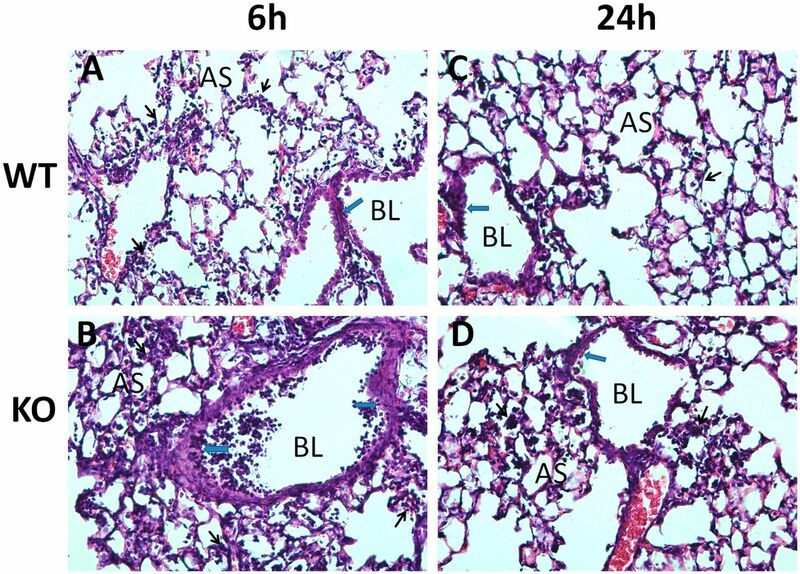 Splunc1 KO mice exhibited more significant peribronchial inflammation, airway lumen leukocyte accumulation, and severe pneumonia after PAO1 infection. Black arrows indicate alveolar inflammation; blue arrows point to peribronchial inflammation. AS, Alveolar space; BL, bronchial lumen. Because Splunc1 has been suggested to possess anti-inflammatory functions (7), we analyzed the cytokine profile of the lungs of Splunc1 KO and WT mice after bacterial infection. Without PAO1 exposure, BALF cytokine levels were not different between Splunc1 KO and WT mice. These proinflammatory cytokines were undetectable in naive mice (data not shown). After exposure, the spectrum of BALF cytokines that were changed did not vary by genotype, but the magnitude of the response was consistently higher in the BALF from Splunc1 KO mice when compared with that of BALF from WT mice (Fig. 5). Proinflammatory cytokines, including IL-1β (Fig. 5A), and chemotactic cytokines, including Cxcl1 (also known as KC; Fig. 5B), were significantly increased in BALF from Splunc1 KO mice as compared with those from WT mice. At 6 h after PAO1 infection, chemokine Ccl3 (also known as MIP-1α; Fig. 5C) increased significantly in BALF from Splunc1 KO mice. Expression of IL-6 in BALF was considerably higher in Splunc1 KO mice than in WT mice at 24 h after inoculation (Fig. 5D). Increased proinflammatory cytokine production in Splunc1 KO mice following PAO1 bacterial challenge. Splunc1 KO and WT mice were infected as described. Cytokine concentrations in BALF were measured using a Luminex assay and are reported in picograms per milliliter. (A) IL-1β; (B) KC; (C) MIP1-α; (D) IL-6 concentrations in BALF at 6 and 24 h after Pseudomonas inoculation. Results are means ± SEM from three independent experiments; n = 4–6 mice/group. *p < 0.05, **p < 0.01 for Splunc1 KO to WT comparisons at each time point. Both BAL cell counts and histological images suggested that there was a more significant increase of PMNs in Splunc1 KO mice than in WT mice; we further examined the expression of several chemokines to distinguish their contribution to the increased PMNs after PAO1 infection. Without PAO1 exposure, the expression of Cxcl1 was slightly less in Splunc1 KO mice, whereas Cxcl2, Cxcl5, and Ccl20 were expressed similarly in Splunc1 KO and WT mice. The expression of Cxcl1 (4-fold), Cxcl2 (2-fold), and Ccl20 (4-fold) were all significantly elevated in Splunc1 KO mice when compared with the expression in WT mice at the 6 h time point after PAO1 infection (Fig. 6A–C). 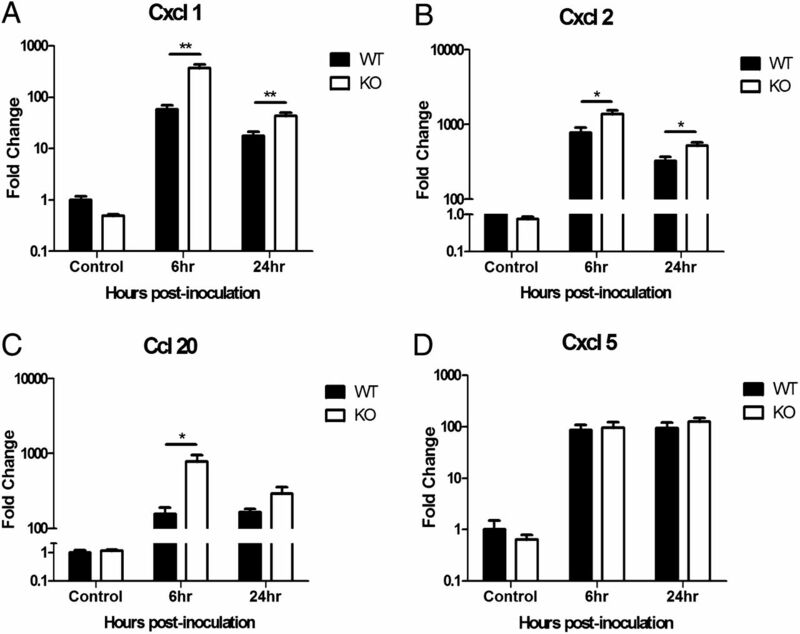 This tendency was preserved at the 24 h time point, when Splunc1-deficient mice maintained a 2-fold level of elevated Cxcl1 and Cxcl2 levels as compared with levels of the WT mice (Fig. 6A, 6B). Interestingly, there was no difference between Splunc1-deficient mice and their WT littermate mice with regard to the expression of Cxcl5, also known as epithelial-derived neutrophil-activating peptide 78, either before or after the PAO1 challenge (Fig. 6D). Increased chemokine expression in Splunc1 KO mice following PAO1 bacterial challenge. Splunc1 deficiency selectively enhances production of a distinct set of chemokines in response to PAO1 infection. Lungs were collected from Splunc1 KO and WT mice. Gene expressions in lungs of mice were quantified by real-time PCR. The expression of chemokine ligands Cxcl1 (A), Cxcl2 (B), and Ccl20 (C) all increased in Splunc1 KO mice whereas Cxcl5 (D) showed no difference compared with expression in WT mice. Results are means ± SEM from three independent experiments; n = 4–6 mice/group. *p < 0.05, **p < 0.01 for Splunc1 KO to WT comparisons at each time point. Secretory proteins from airway epithelium, such as mucin and CCSP, provide components of extracellular lining fluid in the airways and play a major role in mucociliary clearance. Because Splunc1 is one of the most abundant secretory proteins in the airway, and Splunc1-expressing cells overlap with both mucus- and CCSP-producing cells in mouse airways (data not shown), we determined whether the ablation of Splunc1 in mouse airway secretory cells results in defects in other major secretory proteins. Interestingly, the expression of two major airway mucin genes, Muc5ac and Muc5b, as well as CCSP, was significantly decreased in naive Splunc1 KO mice versus WT littermates at baseline, prior to any bacterial challenge (Fig. 7A–C). The decreased expression of Muc5ac, Muc5b, and CCSP in Splunc1 KO mice persisted after the PAO1 challenge at both 6 and 24 h postinfection (Fig. 7A–C). Foxj1, encoded by the Foxj1 gene, is involved in ciliogenesis and is a marker of ciliated cells in airway epithelium. Although Splunc1 is only expressesed in secretory cells of airway epithelium, the deficiency of Splunc1 also results in decreased expression of Foxj1 (Fig. 7D). Our data suggest that the secretory properties of airway epithelium are likely disrupted when Splunc1 is ablated. Splunc1 KO mice exhibit decreased expression of mucociliary clearance-related genes. Splunc1 deficiency influences the expression of major airway secretory proteins, including Muc5ac (A), Muc5b (B), CCSP (C), and ciliated cell marker Foxj1 (D) both before and after PAO1 infection. Results are means ± SEM from three independent experiments; n = 4–6 mice/group. *p < 0.05, **p < 0.01 for Splunc1 KO to WT comparisons at each time point. To further understand how Splunc1 deficiency and the decreased secretion in Splunc1 KO mice influence host defense after pulmonary infection, we examined the expression of several major antimicrobial molecules. The expression of cathelicidin antimicrobial peptide (also known as LL37, FALL39, or CAP18) and lactoferrin was slightly decreased prior to bacterial infection in Splunc1 KO mice, whereas the expression of lysozyme, one of the most abundant antimicrobial proteins, did not vary between Splunc1 KO and WT mice before infection (Fig. 8A–C). Six hours after PAO1 infection in WT mice, the magnitude of the increased expression of LL37 was highest (271-fold, p = 0.0376), followed by the expression of lactoferrin (20-fold, p = 0.0093), whereas there was only a 60% increase in the expression of lysozyme (Fig. 8A–C) when compared with PBS control. At 24 h after PAO1 infection, the expression of LL37 remained 24-fold higher than PBS control (Fig. 8A, p = 0.1814), whereas only a minimal increase was observed in expression of both lactoferrin and lysozyme (Fig. 8B, 8C). However, the inductions of LL37, lactoferrin, and lysozyme in the lungs from Splunc1 KO mice were all significantly suppressed compared with those of WT mice at both 6 and 24 h after PAO1 infection. Surprisingly, the expression of β-defensin 2 did not fluctuate much in mouse lungs with or without PAO1 infection, and there was no difference in the expression of β-defensin 2 between Splunc1 KO and WT mice (Fig. 8D). Splunc1 KO mice display diminished expression of antimicrobial molecules. 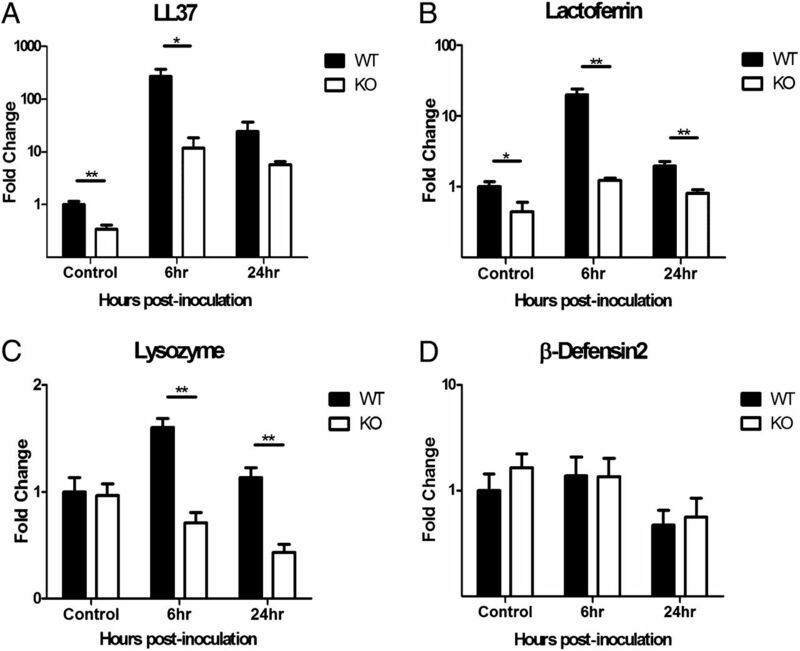 Splunc1 deficiency attenuates expression of major airway antimicrobial peptide LL37 (A) and antimicrobial proteins lactoferrin (B) and lysozyme (C), but it has no effect on β-defensin 2 (D) after PAO1 infection. Results are means ± SEM from three independent experiments; n = 4–6 mice/group. *p < 0.05, **p < 0.01 for Splunc1 KO to WT comparisons at each time point. To determine whether Splunc1 deficiency–associated changes in epithelial secretion and antimicrobial molecules affect P. aeruginosa biofilm formation, we cocultured PAO1 on the apical surface of polarized mouse primary airway epithelial cells. PAO1 forms surface-associated bacterial biofilms on polarized mouse primary airway epithelial cells when cocultured for 6 h at 37°C, as measured by CFU. The ablation of Splunc1 in KO mice significantly increased PAO1 biofilm formation (Fig. 9A) when comparing with cocultured epithelial cells from WT mice. rSPLUNC1 significantly inhibits biofilm formation of Gram-negative bacteria. Determination of anti-biofilm effects of SPLUNC1 on P. aeruginosa is shown. Quantifications were carried out by counting CFU representing biofilm-forming bacteria recovered from the surface of cultured epithelial cells or by measuring the biofilm biomass on abiotic surfaces via crystal violet staining (OD590). (A) CFU of biofilm-forming P. aeruginosa growth on the primary cultured tracheal epithelial cells derived from WT (Splunc1+/+), heterozygous (Splunc1+/−), and KO (Splunc1−/−) mice. (B) P. aeruginosa biofilm biomass measurement after treatment with increasing concentrations of rSPLUNC1. Kanamycin and ampicillin were used as positive controls to disrupt PAO1 biofilm formation. Results are means ± SEM from three independent experiments. *p < 0.05, **p < 0.01 for the comparison between groups. To investigate whether exogenously addition of SPLUNC1 can conversely prevent PAO1 biofilm formation, we carried out microtiter plate–based biofilm assays. We found that when PAO1 was incubated with rSPLUNC1 at increasing concentrations, biofilm biomass decreased and was inversely related to the rSPLUNC1 concentration (Fig. 9B). Airway epithelial host defense against microbial invasion requires an innate immune system whose response is both rapid and independent of prior exposure (18). Airway epithelium exerts its host defense by recognizing the invading microbes and subsequently producing various mediators such as cytokines, mucins, and antimicrobial substances. This antimicrobial function of epithelial cells ensures and initiates an appropriate host defense against invading pathogens. Therefore, epithelial cell–regulated antimicrobial activity is regarded as the lung’s first line of defense against bacterial infection and helps to maintain a sterile intrapulmonary environment. When antimicrobial activities are impaired or insufficient, a second line of defense mediated through neutrophils and macrophages may kill the bacteria and release cytokines. Respiratory infectious diseases occur when the innate immune response is insufficient to combat bacterial invasion. Our investigation into the essential role of SPLUNC1 (and mouse Splunc1) in alleviating PAO1 infection-induced mortality builds on earlier studies demonstrating that mice overexpressing SPLUNC1 exhibit enhanced protection against pathogen infection (7). Using a Splunc1 KO knockout mouse model, we sought to determine whether the loss of expression of Splunc1 would result in increased host susceptibility to PAO1 infection or influence the integrity of airway epithelial secretion and antimicrobial activity. Results from prior in vitro studies (4, 8) have demonstrated the SPLUNC1-mediated antimicrobial activity against PAO1, but the critical role of the responses from lung epithelial cells with regard to susceptibility to PAO1 infection in a Splunc1-deficient animal model has not been investigated. Effective host defense against microbial invasion requires an innate immune system with coordinated effort from both epithelial and inflammatory cells. Several secreted proteins from airway epithelium contribute to this innate immune response, and data presented in this study indicate that SPLUNC1 is a member of this group of proteins. The goal for this study was to investigate the biological relevance of SPLUNC1 expression in airway epithelial secretions and its associated antimicrobial activities upon acute respiratory infection. Our studies addressed two questions. First, does ablation of SPLUNC1 change host susceptibility to respiratory infection? Second, does SPLUNC1 make a significant contribution to the overall airway mucociliary clearance and antimicrobial activity? Our results provide evidence of a crucial role for SPLUNC1 in the mitigation of bacterial infection. We have also reported that Splunc1 deficiency is associated with lower expression of major airway secretory proteins and antimicrobial molecules, which may have accounted for the increased susceptibility to respiratory infection in the Splunc1 KO mice. This study provides in vivo evidence that SPLUNC1 plays a protective role in the context of infection of a very important airway pathogen, P. aeruginosa. Splunc1 KO mice displayed a significant decrease in survival rates as well as accelerated mortality when challenged with PAO1. The increased sensitivity correlated with elevated bacterial burdens in the lung and BALF as well as the increased production of inflammatory cytokines and chemokines suggest that Splunc1 KO mice were unable to efficiently control PAO1-caused respiratory infection. The ablation of Splunc1 also modified their inflammatory response. We found that when Splunc1 KO and WT control mice were infected with PAO1, the BALF of the Splunc1-deficient mice had elevated levels of inflammatory cytokines, including IL-1β, KC, MIP-1α, and IL-6. The increased levels of these cytokines indicate the enhanced inflammatory response after PAO1 infection. 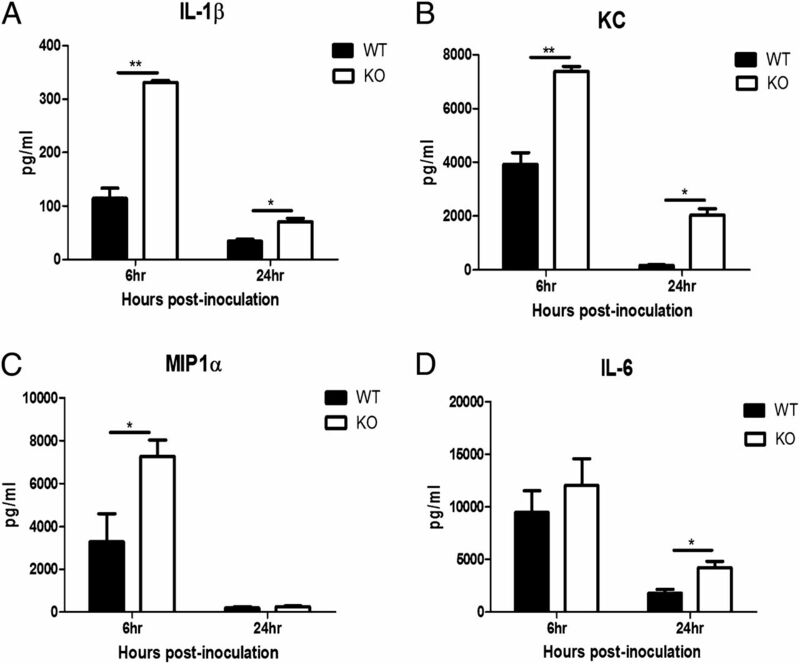 The increased susceptibility and bacterial burden in Splunc1 KO mice result in the higher levels of IL-1β, KC, and other proinflammatory mediators. These results indicate that in an acute respiratory infection condition, SPLUNC1 plays a key role in regulating inflammatory responses to PAO1 infection to prevent an overexaggerated cytokine production that could damage lung tissues. Splunc1 KO mice developed more severe pneumonia than did WT mice after PAO1 infection, accompanied with enhanced peribronchial and perivascular leukocyte infiltration. To understand what accounted for the augmented chemotactic activity that recruited the increased PMNs, we found that the expression of Cxcl1, Cxcl2, and Ccl20 was significantly upregulated in Splunc1 KO mice as compared with the expression in WT mice after PAO1 infection. 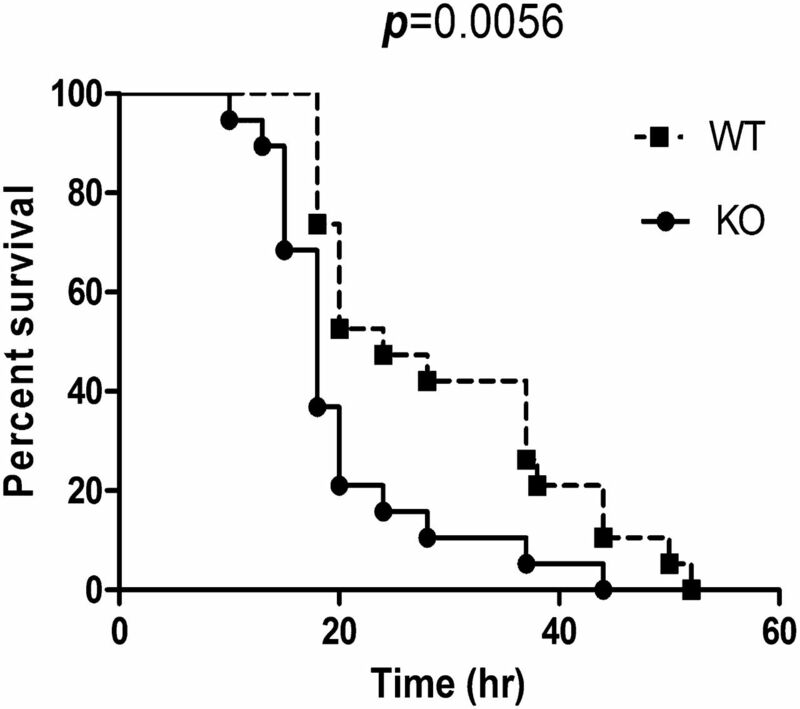 Interestingly, the chemokine Cxcl5, which shares the same chemokine receptor Cxcr2 with both Cxcl1 and Cxcl2, did not show any difference in expression between Splunc1 KO and WT mice. CXCL1, also named KC, is expressed by macrophages, neutrophils, and epithelial cells (19, 20), and it has strong neutrophil chemotactic activity (21). CXCL2, also known as MIP2-α, is secreted by monocytes and macrophages and has chemotactic activity for PMNs and hematopoietic stem cells (22, 23). CXCL5 stimulates the chemotaxis of PMNs that possess angiogenic properties (24). CXCL1 and CXCL2 are closely related chemokines with high sequence homology and have been associated with Pseudomonas infection (25, 26). Ligands CXCL1, CXCL2, and CXCL5 all bind to a common chemokine receptor, CXCR2, which in mammals is expressed on the surface of neutrophils. Our data indicate that the enhanced PMN recruitment in Splunc1 KO mice after PAO1 infection may have been mediated through chemokine ligands Cxcl1 and Cxcl2, but not Cxcl5, to activate the Cxcr2 receptor. A similar observation regarding differentially regulated chemokines after PAO1 infection was previously demonstrated. Carrigan et al. (27) reported that IFN regulatory factor 3–deficient mice showed complete inhibition of CCL5 (RANTES) and CXCL10 (IFN-γ–inducible protein 10) production, partial inhibition of TNF, but no effect on CXCL1 or CXCL2 expression in response to PAO1-induced lung infection. Mucociliary clearance is a self-clearing mechanism of the airway to remove inhaled pathogens and particulates. The mechanisms of airway secretion and mucociliary clearance are critical components of lung innate immunity. Mucociliary clearance is characterized by the upward movement of mucus through ciliary motion that requires a balance between the volume and composition of the mucus, adequate periciliary liquid volume, and normal ciliary beat frequency (28). Airway secretions are mainly produced by goblet cells and submucosal glands, but they also include small amounts of surfactant from Clara cells and other fluids that are part of the airway epithelium fluid. Cilia beating by ciliated cells is also critical in affecting the clearance of mucus and trapped objects (29, 30). 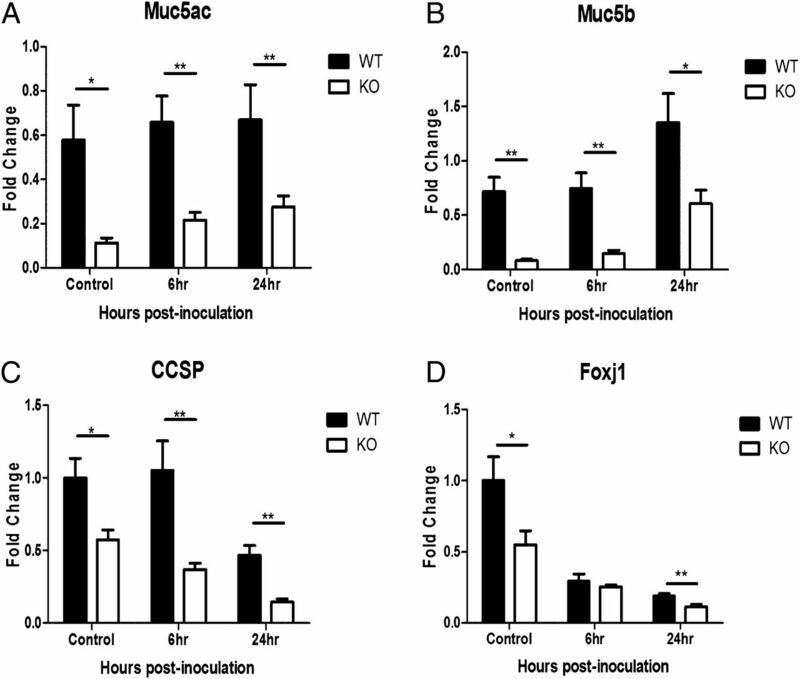 Thus, a deficiency in the expression of airway secretion and cilia-associated genes (MUC5AC, MUC5B, CCSP, and FOXJ1) in Splunc1 KO mice strongly suggests a compromised mucociliary clearance. Mucins are highly glycosylated macromolecules, and >21 different MUC genes have been described. MUC5AC and MUC5B are the two major gel-forming mucins in the airway and are thus thought to contribute to both the defensive barrier function and the rheology of airway mucus (31). The quality and quantity of mucins determine the viscoelastic property of mucus, which is important for mucociliary clearance. Our data showed that the expression of mouse Muc5ac and Muc5b were drastically decreased in the lung tissue of Splunc1 KO mice as compared with that of WT mice, even prior to bacterial infection. SPLUNC1 may exert its protective function against bacterial infection by affecting mucin production in airway epithelium. It has been suggested that SPLUNC1 is a novel airway secretory protein with a surfactant protein function that modulates surface tension (8). Therefore, one of the potential SPLUNC1-mediated antimicrobial mechanisms is that SPLUNC1 maintains homeostasis of airway secretion and contributes to mucociliary clearance during respiratory infection. These results suggest that SPLUNC1 is not only one of the most abundantly secreted proteins in the airway, but also that the expression and existence of SPLUNC1 are important to the functional integrity of airway secretions. CCSP is a 16-kDa homodimeric polypeptide secreted by respiratory epithelial Clara cells in the airway lining fluid of conducting airways (32). Levels of CCSP are decreased in the mice lungs following acute PAO1 infection, and CCSP deficiency has been associated with enhanced pulmonary inflammation after acute pulmonary infection with PAO1 (33–35). Our data showed that the expression of CCSP was significantly decreased in the lung tissue from Splunc1 KO mice as compared with that of WT mice at both the naive stage and after PAO1 infection. FOXJ1 is a FOX family member transcription factor regulating ciliogenesis, and its expression is normally restricted in the ciliated cells of lungs, spermatids, oviducts, and choroid plexus (36, 37). Foxj1 gene interruption (Foxj1 KO) in mice results in prenatal lethality and a lack of ciliated epithelial cells in tissues, including those of the lung and oviduct (38). The initial observation that Foxj1 expression was downregulated in mice prone to systemic lupus erythematosus led to the suggestion that FOXJ1 might have a role in the prevention of autoimmune reactions. Our data showed that the expression of Foxj1 was notably lower in the lung tissue from Splunc1 KO mice than that from WT mice. It has been reported that during lung development, cells expressing CCSP can give rise to ciliated cells (39, 40). Although ciliated cells are different from the CCSP-expressing secretory cells that produce Splunc1, the regulatory mechanism on how Splunc1 ablation affects expression of Foxj1 in ciliated cells is an interesting question worth future investigation. The airway secretes a number of antimicrobial products that act directly on invading bacteria or viruses, and their expressions are inducible upon recognition of pathogens. The antimicrobial molecules produced by airway epithelium can be small cationic molecules, such as LL37 and β-defensin, or larger proteins, such as lysozyme and lactoferrin. Cationic antibacterial peptides play an important role in innate host defense, particularly by preventing bacterial infections at mucosal surfaces that form a shield between the host and the external environment. Overexpression of LL37 after pulmonary gene transfer in mice results in enhanced bacterial clearance after pulmonary PAO1 infection (41). In addition to its antimicrobial activity, LL37 also induces multiple immunomodulatory effects on lung epithelial cells. A treatment of polarized normal human bronchial epithelial cells with LL37 resulted in an increase in epithelial cell stiffness as well as a decrease in cell permeability and PAO1 uptake that protected epithelial cells from bacterial infection (42). Lactoferrin is an antimicrobial and an iron-chelating protein of the innate immune system found in most body fluids. Lactoferrin has been demonstrated to inhibit PAO1 biofilm formation by triggering bacterial motility (43–45). Lysozyme also plays a key role in the innate immune system of vertebrates and invertebrates by hydrolyzing peptidoglycan, a vital component of the bacterial cell wall. Lysozymes are highly expressed in animal airways and have established roles in combating respiratory infections. However, bacterial infections of the animal airway are still relatively common, suggesting that endogenous lysozyme function is insufficient during acute or chronic infections (46–49). The significantly decreased production of LL37, lactoferrin, and lysozyme after PAO1 challenges in Splunc1 KO mice may have contributed to the increased susceptibility to Pseudomonas infection. The equivalent response between Splunc1 KO and WT mice with regard to β-defensin expression before and after PAO1 infection suggests that Splunc1 deficiency only affects selective antimicrobial molecules and has no direct effect on β-defensin. Our data suggest that the lack of Splunc1 in airway epithelium may have a critical effect not only on the overall antimicrobial response, but also on the expression of other antimicrobial molecules. It is possible that Splunc1 may directly regulate the expression of LL37 and lactoferrin but not β-defensin. In conclusion, this study provides direct in vivo evidence that SPLUNC1 plays a critical role in the context of infection of an important airway pathogen. Deficiency of SPLUNC1 decreased airway epithelial cell–originated antimicrobial protection against opportunistic pathogens, such as PAO1. Splunc1 KO mice showed accelerated mortality and increased susceptibility to PAO1 infection, as compared with their WT littermates. The Splunc1 deficiency also resulted in diminished mucociliary clearance, as expressions of several major secretory proteins and antimicrobial molecules of epithelium were significantly decreased in the lungs of Splunc1 KO mice when compared with those of WT mice. Based on our findings, we propose that SPLUNC1 is a multifunctional protein whose host defense functions include direct inhibition of bacterial growth, prevention of biofilm formation, modulation of neutrophil activity, regulation of other antimicrobial peptides/proteins, and facilitation of mucociliary clearance (Fig. 10). PAO1 infection is one of the most common airway infections associated with chronic colonization in cystic fibrosis patients. Recently, it has been suggested that genetic polymorphisms in SPLUNC1 may be associated with the disease severity of cystic fibrosis patients. This further illustrates the importance of SPLUNC1 in Pseudomonas infection, although the treatment of Pseudomonas infection will continue to be a daunting and challenging task. This study should provide a better understanding of airway epithelial cell–initiated host defense that may provide an alternative approach to efficiently combat airway bacterial infection in the future. Mechanisms underlying SPLUNC1 antibacterial function. SPLUNC1 may regulate the expression of other epithelial antimicrobial peptides/proteins and modulate airway secretion; SPLUNC1 is a surfactant protein, which decreases airway surface tension and enhances mucociliary clearance as well as interferes with bacterial biofilm establishment. SPLUNC1 may also exert antibacterial activity by inhibiting bacterial growth. Following P. aeruginosa exposure, the deficiency of epithelial SPLUNC1 results in compromised host defense and increased susceptibility to bacterial infection. We thank Dr. Shengli Gao and Rahel Birru for technical assistance. This work was supported by Public Health Service/National Institutes of Health Grant HL091938 (to Y.P.D. ), the University of Pittsburgh Cystic Fibrosis Foundation Research Development Program (to Y.P.D. ), the University of Pittsburgh Central Research Development Fund (to Y.P.D. ), and National Heart, Lung, and Blood Institute/National Institutes of Health Grant HL088264 (to H.W.C).
. 2011. Innate immunity in the respiratory epithelium. Am. J. Respir. Cell Mol. Biol. 45: 189–201. 2011. Functional roles of SPLUNC1 in the innate immune response against Gram-negative bacteria. Biochem. Soc. Trans. 39: 1051–1055. 2012. Role of epithelial mucins during airway infection. Pulm. Pharmacol. Ther. 25: 415–419.
. 2013. Multifunctional role of human SPLUNC1 in Pseudomonas aeruginosa infection. Infect. Immun. 81: 285–291.
. 2003. Molecular cloning and characterization of spurt, a human novel gene that is retinoic acid-inducible and encodes a secretory protein specific in upper respiratory tracts. J. Biol. Chem. 278: 1165–1173.
. 2004. Purification and characterization of PLUNC from human tracheobronchial secretions. Am. J. Respir. Cell Mol. Biol. 30: 184–192.
. 2011. Antimicrobial activity of PLUNC protects against Pseudomonas aeruginosa infection. J. Immunol. 187: 382–390. 2010. PLUNC is a novel airway surfactant protein with anti-biofilm activity. PLoS ONE 5: e9098.
. 2007. Function and regulation of SPLUNC1 protein in Mycoplasma infection and allergic inflammation. J. Immunol. 179: 3995–4002.
. 2011. SPLUNC1 promotes lung innate defense against Mycoplasma pneumoniae infection in mice. Am. J. Pathol. 178: 2159–2167.
. 2013. Dual acute pro-inflammatory and anti-fibrotic pulmonary effects of SPLUNC1 after exposure to carbon nanotubes. Am. J. Respir. Cell Mol. Biol. PMID: 23721177.
. 2009. SPLUNC1 regulates airway surface liquid volume by protecting ENaC from proteolytic cleavage. Proc. Natl. Acad. Sci. USA 106: 11412–11417. 2003. Multicentre surveillance of Pseudomonas aeruginosa susceptibility patterns in nosocomial infections. J. Antimicrob. Chemother. 51: 347–352.
. 2013. SPLUNC1/BPIFA1 contributes to pulmonary host defense against Klebsiella pneumoniae respiratory infection. Am. J. Pathol. 182: 1519–1531.
. 1998. Flagellar and twitching motility are necessary for Pseudomonas aeruginosa biofilm development. Mol. Microbiol. 30: 295–304.
. 2008. In vitro analysis of tobramycin-treated Pseudomonas aeruginosa biofilms on cystic fibrosis-derived airway epithelial cells. Infect. Immun. 76: 1423–1433.
. 1998. Clara cell secretory protein decreases lung inflammation after acute virus infection. Am. J. Physiol. 275: L924–L930.
. 1999. Phylogenetic perspectives in innate immunity. Science 284: 1313–1318.
. 1990. Cloning and sequencing of a new gro transcript from activated human monocytes: expression in leukocytes and wound tissue. Mol. Cell. Biol. 10: 5596–5599.
. 1994. Constitutive and stimulated MCP-1, GROα, β, and γ expression in human airway epithelium and bronchoalveolar macrophages. Am. J. Physiol. 266: L278–L286.
. 1992. High- and low-affinity binding of GROα and neutrophil-activating peptide 2 to interleukin 8 receptors on human neutrophils. Proc. Natl. Acad. Sci. USA 89: 10542–10546.
. 2006. Peripheral blood stem cell mobilization: the CXCR2 ligand GROβ rapidly mobilizes hematopoietic stem cells with enhanced engraftment properties. Exp. Hematol. 34: 1010–1020.
. 1989. Identification and characterization of macrophage inflammatory protein 2. Proc. Natl. Acad. Sci. USA 86: 612–616.
. 1991. Structure and neutrophil-activating properties of a novel inflammatory peptide (ENA-78) with homology to interleukin 8. J. Exp. Med. 174: 1355–1362.
. 2011. The therapeutic potential of the humoral pattern recognition molecule PTX3 in chronic lung infection caused by Pseudomonas aeruginosa. J. Immunol. 186: 5425–5434.
. 2005. Influence of cystic fibrosis transmembrane conductance regulator on gene expression in response to Pseudomonas aeruginosa infection of human bronchial epithelial cells. Infect. Immun. 73: 6822–6830.
. 2012. Effects of second hand smoke on airway secretion and mucociliary clearance. Front Physiol 3: 342.
. 2002. Mucus clearance as a primary innate defense mechanism for mammalian airways. J. Clin. Invest. 109: 571–577. 2004. Regulation of airway surface liquid volume and mucus transport by active ion transport. Proc. Am. Thorac. Soc. 1: 42–46.
. 2008. Structure and function of the polymeric mucins in airways mucus. Annu. Rev. Physiol. 70: 459–486.
. 1990. Clara cell 10 kDa protein (CC10): comparison of structure and function to uteroglobin. Biochim. Biophys. Acta 1039: 348–355.
. 2002. Pseudomonas aeruginosa and tumor necrosis factor-α attenuate Clara cell secretory protein promoter function. Am. J. Respir. Cell Mol. Biol. 26: 216–223.
. 2000. Regulation and function of CCSP during pulmonary Pseudomonas aeruginosa infection in vivo. Am. J. Physiol. Lung Cell. Mol. Physiol. 279: L452–L459.
. 2010. Clara cells attenuate the inflammatory response through regulation of macrophage behavior. Am. J. Respir. Cell Mol. Biol. 42: 161–171.
. 1995. Primary structure of hepatocyte nuclear factor/forkhead homologue 4 and characterization of gene expression in the developing respiratory and reproductive epithelium. Proc. Natl. Acad. Sci. USA 92: 4249–4253.
. 1994. Members of the HNF-3/forkhead family of transcription factors exhibit distinct cellular expression patterns in lung and regulate the surfactant protein B promoter. Dev. Biol. 166: 195–209.
. 1998. Mutation of the mouse hepatocyte nuclear factor/forkhead homologue 4 gene results in an absence of cilia and random left-right asymmetry. J. Clin. Invest. 102: 1077–1082.
. 1992. The role of the nonciliated bronchiolar epithelial (Clara) cell as the progenitor cell during bronchiolar epithelial differentiation in the perinatal rabbit lung. Am. J. Respir. Cell Mol. Biol. 7: 606–613.
. 2005. Conditional recombination reveals distinct subsets of epithelial cells in trachea, bronchi, and alveoli. Am. J. Respir. Cell Mol. Biol. 33: 455–462.
. 1996. The human gene FALL39 and processing of the cathelin precursor to the antibacterial peptide LL-37 in granulocytes. Eur. J. Biochem. 238: 325–332.
. 2011. Cathelicidin LL-37 increases lung epithelial cell stiffness, decreases transepithelial permeability, and prevents epithelial invasion by Pseudomonas aeruginosa. J. Immunol. 187: 6402–6409.
. 2004. Lactoferrin functions: current status and perspectives. J. Clin. Gastroenterol. 38(6, Suppl. ): S127–S129.
. 2002. A component of innate immunity prevents bacterial biofilm development. Nature 417: 552–555.
. 2012. Inhibitory effects of lactoferrin on biofilm formation in clinical isolates of Pseudomonas aeruginosa. J. Infect. Chemother. 18: 47–52.
. 2002. Cationic polypeptides are required for antibacterial activity of human airway fluid. J. Immunol. 169: 6985–6991.
. 2005. Decreased clearance of Pseudomonas aeruginosa from airways of mice deficient in lysozyme M. J. Leukoc. Biol. 78: 1081–1085.
. 2005. Lysozyme secretion by submucosal glands protects the airway from bacterial infection. Am. J. Respir. Cell Mol. Biol. 32: 548–552.
. 1999. 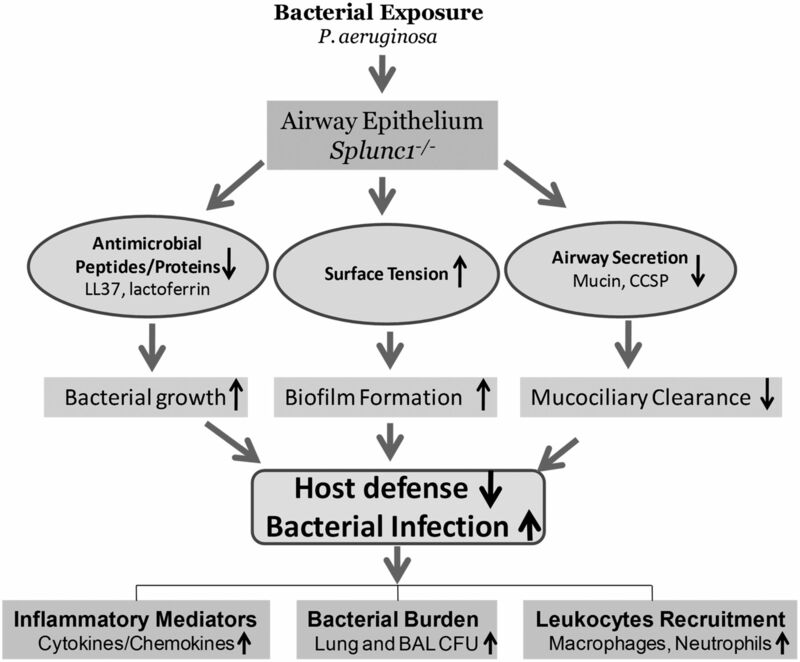 Activity of abundant antimicrobials of the human airway. Am. J. Respir. Cell Mol. Biol. 20: 872–879.